I am currently reading The Origin Of Wealth - a book which tries to explain in what deep explanatory troubles classical equilibrium economics have gotten into during the last two decades. One of the main messages is that economic systems are no closed systems that could theoretically reach an equilibrium - they are highly dynamic and interactions are so complex that they will only -suddenly- reach an equilibrium when all involved players are dead. 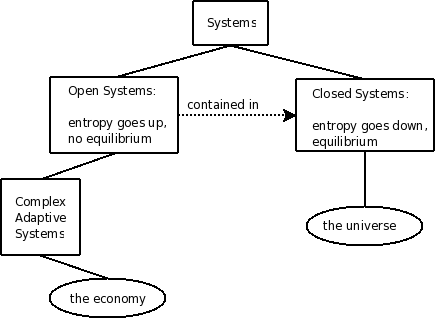 This simple drawing I made should resemble some of the most basic physical classification of systems and where economic systems belong. The author says that classical economics would want to place an economy in the right branch and therefore never have a model close to reality. After economics borrowed the notion of an equilibrium from physics (roughly 100 years ago), physics moved on and discovered entropy and the second law of thermodynamics. Chaos and Complexity have now been discussed fundamentally by almost all basic sciences, but seldom in economics.